This week we find the previous Florida Resident rates dried up, and the Panama Canal cruise for US Military personnel unlisted, but still searchable with the MTO offer code. The offer for Canadian residents on this summer’s Alaskan sailings is now down to one. The Farewell to Galveston onboard credit offer aboard the Disney Wonder remains available when you book before June 30th. I noticed the addition of two Galveston sailings on 11/30 and 12/7. I am not sure if I previously missed these dates, or if they are new additions. The special offer on Miami sailings aboard the reimagined Disney Magic are available for the 5-Night Western Caribbean sailings in November when you book by the end of July. One sailing remains for the Canadian resident special offer of 25% off the prevailing rate for the September 2nd Disney Wonder Alaskan Cruise sailing from Vancouver. Use promo code CAN when searching online for the Canada Resident Offer. Rates are valid for categories 11C up to 4A. Government fees and taxes are an additional $100 per person and are subject to change. Special Rates for U.S. Military Personnel (MTO) are available for the September Panama Canal Cruise on the Disney Wonder and are valid through June 2, 2013. These rates are limited to 50 staterooms per category and sailing. I mentioned this sailing was no longer listed on Disney’s special offers page, but it is still searchable online. Save on select sailings from Miami this November . It is worth noting that it was officially announced last week that the Magic will undergo a major overhaul in September and October. This offer is a great way to experience the re-imagined Disney Magic! This special excludes the Thanksgiving sailing. This offer is available through the end of July 2013. 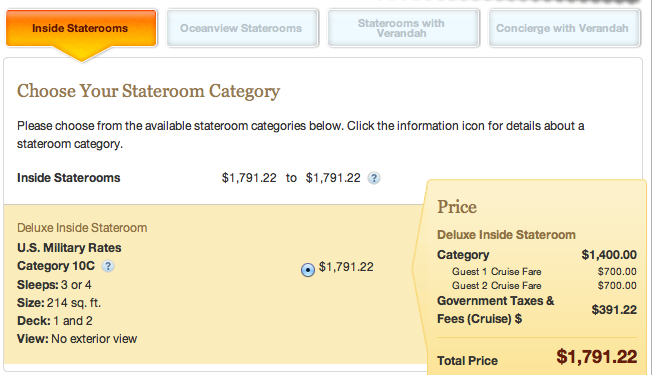 Rates start at $625 ($125/per day) per person for a Category 11C Standard Inside Stateroom. Disney Cruise Line is saying goodbye to Galveston, Texas with special rates on select sailings aboard the Disney Wonder start at $699 per person for a Category 11C Standard Inside Stateroom. Most sailings between September 28, 2013 through November 16, 2013 and November 30, 2013 through December 7, 2013 are included. The notable exception is the Thanksgiving cruise on 11/23 which is not included. When you book one of these Galveston sailings through June 30, 2013, you only need to pay half your deposit at the time of booking with the other half due with your final payment. As a bonus, you will receive an onboard credit (OBC) up to $200 based on the stateroom category you book. There are now Florida Resident rates listed. All of the special rates can be booked online using the MTO, CAN, or WON rate codes. If you are not sure how to search for a cruise using these special rate codes check out this video tutorial. This entry was posted in Special Offers and tagged Alaskan Cruise, CAN, Canadian Resident Rate, Galveston, Miami, MTO, WON by Scott Sanders. Bookmark the permalink.